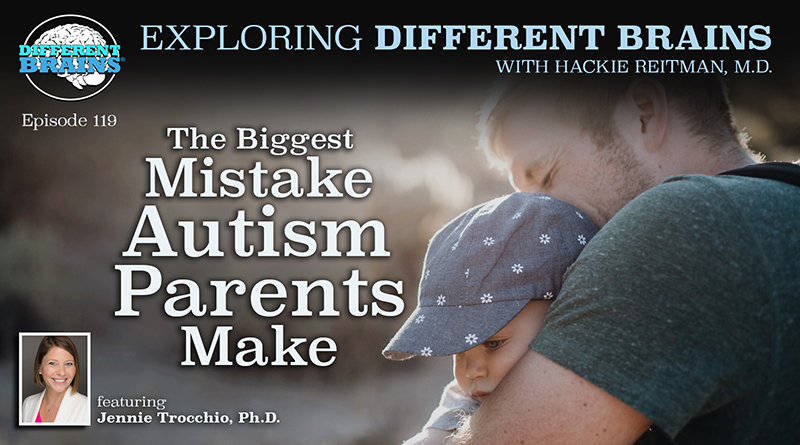 (27 mins) In this episode, Dr. Hackie Reitman speaks with Denise Resnick. Denise is the Founder, President, and Board Chair of First Place AZ – a nonprofit dedicate to developing new, innovative housing options for adults with autism and other special abilities, as well as co-founder of SARRC (Southwest Autism Research & Resource Center). Denise discusses the First Place AZ mission, her own experiences with an adult child on the autism spectrum, and supporting individuals with autism and their families throughout their lifetimes. HACKIE REITMAN, M.D. 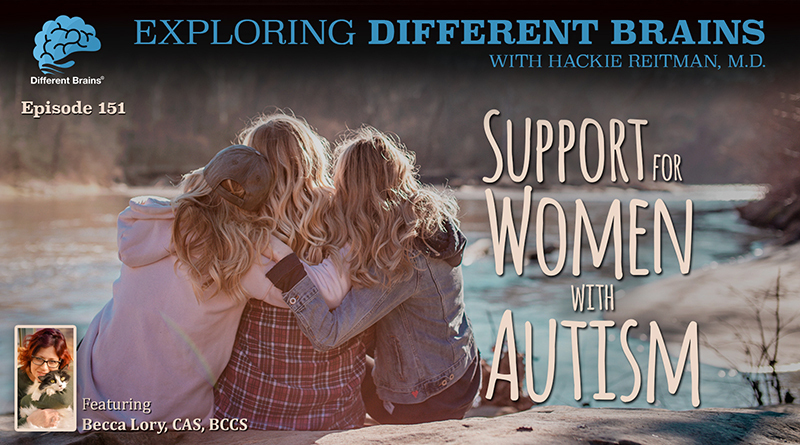 (HR): Hi I’m Dr. Hackie Reitman, welcome to another episode of Exploring Different Brains and today we have the honor and privilege of talking with somebody I met out in Arizona back in 2015 at the USAAA we were both there presenting and Denise Resnik from Arizona who’s doing so much for those of us whose brains are different and I’m going to get right into it Denise because I want you to introduce and explain everything you’re doing because you’re doing a lot of things all at once. DENISE RESNIK (DR): Well thank you Hackie. In terms of explaining I have to start with our own son Matt, who’s 26, and recognize that this has been a journey for a very long time. In 1997, 20 years ago we started the Southwest Autism Research and Resource Center. It was all about advancing discoveries and also ensuring that individuals with autism and their families would be supported throughout their lifetimes. And through the years we’ve developed a very supportive community thanks to lots of partners and friends and family members and people who jumped in to get involved. Families like my own and what we did over the last 15 years was to really set the stage for what would happen next and that’s residential and that’s ensuring that adults like our son and so many others like him have more options in terms of where they live, who they live with and how they live. And so we’ve been studying this for a very long time and the good news is five years ago we formed a sister nonprofit to SARRC and last year we broke ground on our first innovative property we call First Place Phoenix. HR: What a great story, now what I want to do is I want you to say the names and websites for each of these organizations right from the get-go. I want our viewers to be aware. DR: Terrific. The Southwest Autism Research and Resource Center at www.autismcenter.org is an organization that works with families and individuals throughout their lifetimes. We work with teachers and training, we work with families and early diagnosis and early intervention. We work with young adults in helping them integrate into the community through volunteer work and really developing their skills. And we also have an Employment Program. The organization I founded five years ago is called First Place AZ and it can be found at www.firstplaceaz.org. And this is our expression of recognizing that individuals with autism and other neurodiversities need more choices and when we talk about first place we recognize we are not only a real estate developer but we are also a community developer. Because everyone wants a home but home is just part of the much bigger picture what do you do all day where do you work, where do you worship, where do you recreate, where are your friends, and more importantly how do get there? Which is why we cited First Place Phoenix within walking distance of public transit and our light rail. HR: Remarkable on many fronts. Not the least of which is that we as a society have inadvertently discriminated against adults, all about the kids, well guess what? The kids become adults and adults need jobs, adults need a place to live, adults need to maximize whatever potential for independence they have, as do children. So what you’ve done is you’re tackling the whole spectrum and you’re saying, “look let’s not just build a quote ‘room,’ let’s build a community.” And by the way this is what’s happening in newer multifamily development in general where they’re– you know, it’s a combination of the workspace with the residential space and you have a community and you don’t want to have to hop in a car and go everywhere. DR: You’re absolutely right Hackie. And by way of background I also have a marketing communications firm of more than 30 years and have worked with some of the finest real estate and community developers in the country. And I did learn early on the very thing that you’re talking about and that is quality and that is good living and that is choice. 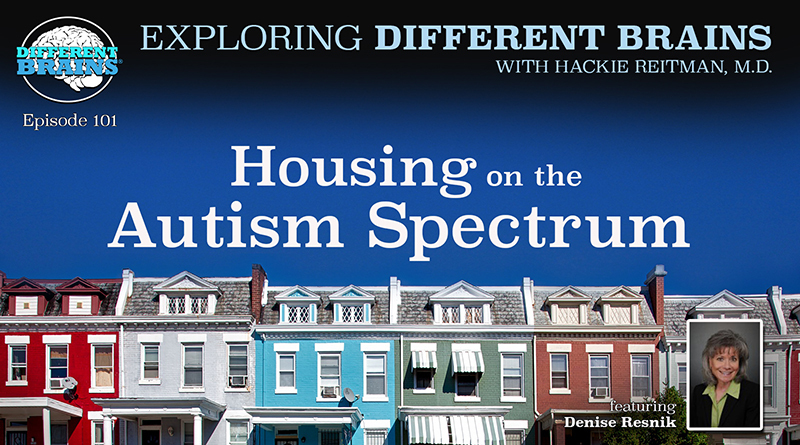 And for the longest time we kept focusing in on autism on individuals with autism and other differences and we looked down at the problem, we actually studied with the Urban Land Institute in Arizona State University over a hundred different residential options across the country. And truly it was when we started looking up. When we started looking up to see how do other people want to live and where do they want to live and recognizing that they want choices just like we want choices. That’s when we really started getting our momentum. And as a mom I experienced firsthand our son got placed in a classroom and then he was gonna get placed in a job and I saw some of those homes early on that we might have considered having someone place him in and they weren’t acceptable. I wanted Matt and many families want their children and their adults to have more choice and to be able to live with who they want and integrate it into the community and that’s what we’re doing here in Phoenix and it’s truly been this last 20 years of community development, which is not only making First Place Phoenix possible but it’s also making other properties possible. And I’d love to tell you a little bit more about first place Phoenix. HR: Well let’s hear more about First Place Phoenix because you’re the first of your kind. DR: Well we believe we are. We are developing right now a 15 million dollar eighty-one thousand square foot property that has a mix of uses. It has 55 apartments, single, two-bedroom, and four bedroom suites. We also have a transition Academy and that transition Academy is for students and that is a program that is currently operating today and I want to tell you about that one too, and the third component of first place is our First Place Global Leadership Institute recognizing that after nearly 20 years of study that this has never been about just creating one property but truly creating a standard bear in markets where we would like to have a presence now and in the future. And my career interestingly started more than 30 years ago at the Del Webb Corporation and for those viewers who know Del Webb Corporation, they’re the granddaddy of senior living. They developed Sun City about 60 years ago, a beautiful retirement community. And you think about where we are today with housing for special populations where we were 60 years ago with Del Webb and retirement communities there weren’t very many, but now you look at any community and you see lots of different options and different price points and different amenities and features and we know seniors are not alike we have young vibrant re-careering seniors like myself. We have others who need some medical attention and we have lots of space in between and so goes you know people with differences and people with autism and other neurodiversities that we need more choices. That it’s not a one size fits all approach and we’ve taken everything we’ve learned over the past 20 years and very specific design folds and guidelines that we created with leaders in the real estate field and with clinical support and we’re illustrating that through First Place which will be open the summer of next year. HR: That must have been an absolutely Herculean effort to get First Place going, I can only imagine. DR: Well it has been an effort and it’s been a lot of people working together to make it happen. In just an almost three years ago we opened our beta site property for the First Place transition Academy. Students, participants, they–during the two years of the program–will take 32 semester length courses that we created that are all about life skills and career readiness and interpersonal skills they will all learn how to try to navigate public transportation, they’ll all work or volunteer. They’ll not only learn about these skills but they’ll put them to the test and there are two bedroom apartments, which we affectionately refer to as their independent living classrooms. They’ll learn about relationships, getting along with a roommate, for how what to do when you don’t get along with the roommate, how to make friends how to keep a friend, and by the end of the two-year program they will save enough for their first and last month’s rent as part of their financial literacy program so that they can move on to their next place. And we just graduated our first class last spring. a new class has begun of freshmen and we also have our sophomores and we are currently enrolling students and our July 2018 program so for anyone who is interested after they leave high school to have the desire to want to learn how to live independently and have a family who want to support you to live independently then this could be a program for them, and when I talk about the family it also means not sabotaging a program. Because if you blew your money early in the week you might not be able to enjoy pizza night and therefore there’s a natural consequence built in for learning, because life is filled with natural consequences of learning what to do, what not to do, and it’s a lifelong learning program but really helping people early in adult life about empowering them so that they have more options and a greater chance to succeed in all kinds of places and spaces. HR: Which is kind of a segue into the entrepreneurial approach to employment jobs of which you have some experience with that with your son Matt. Why don’t you tell us about that? DR: When our son Matt graduated from high school about four, five years ago and it is daunting to think about what you do with a hundred and sixty eight hours every week when the school bus stops coming. And he was always a kid who enjoyed baking with me. He never ate anything that we made, but it was quite popular at school to be bringing in cookies and pastries and cupcakes all the time. And we created a product called SMILE Biscotti. I just so happen to have one right here, that’s a SMILE Biscotti. The smile is an acronym that stands for supporting my independent living enterprise and it is an enterprise that is staffed by individuals with different brains and they all complement each other in the same way you just expressed and illustrated, where Matt is amazing with his co-worker who has autism and apraxia. They will crack 500 eggs in less than an hour and other different brains are lead bakers. As a matter of fact Matt’s friend and lead Baker made about twenty thousand dollars last year baking for SMILE Biscotti. The product is sold at Sky Harbor International Airport at Pete’s coffee and tea and it’s the second top sales item of all their passive goods. It truly expresses a feel-good versus a “feel sorry for me” approach to employment, to integration into the community, and to recognizing someone’s ability who has a different brain and that’s what it’s all about. HR: And what I want to do is I want to introduce Matt to some of the people I just met, who like him are rugged individualists starting their own enterprise and they have autism and we’re going to do that and we’re going to highlight all of them also, when we do this. We’re going to be coming up with a series of free webinars mainly to network all these individual leaders because really when we do something we don’t realize we’re a leader in it many times. You think everyone can start the types of organizations you’ve started and housing and a business. And many of us don’t understand the overlap between all of these issues. It’s all really the same stuff in a way. DR: And that’s what I love about Different Brains and that’s what I love about you in terms of this desire to bring us all together and get out of our silos and it’s one of the reasons also that we’ve started the First Place Global Leadership Institute, which is the third use of First Place and it has five centers. There’s a Center for real estate and Community Development, one for training and employment and education, another for applied research, one for expression, and another one for public policy. and it is a demonstration of how we can bring great minds together to learn from each other and to collect data we know that there’s strength in numbers in terms of advancing supportive public policy and we know the power of storytelling which is what you and your team do so very well. We are hosting a symposium in October, October 25th through 27th, inviting people who have expressed an interest in Phoenix and in First Place and SARRC to join us so that they can learn from us and we can learn from them. And that that symposium and information about it can also be found on our website at www.firstplaceaz.org. HR: Fantastic, and as I understand it you are going to have people from all over the world. DR: On a weekly basis we get quite a few calls of people who want to come to visit but we also have full-time jobs so it’s hard to drop everything to entertain some of those people but we have dropped quite a bit to bring people through First Place outside of the symposia and we’re hoping that more will take advantage of it because it’s not just about their experiencing our supportive community but our helping them also recognize their assets in their community and how they go about building the community in the same way that we’ve built ours and recognizing that there’s more opportunities out there for all of us. And we were so honored last year when PBS news hour acknowledged Phoenix as the most autism friendly city in the world in a two-part series that was called A Place in the World. And so we’re hoping that we can help others create more places just like we’re trying to do in our own backyard. HR: And everything you do is so time-consuming. How do you how do you prioritize your time? HR: I just want to read for our audience, and I have to read it because there’s so many, some of the other organizations on which you serve. the Autism Speaks Housing Committee, Advancing Futures for Adults with Autism Leadership Council, the National Association of Residential Providers for Adults with Autism, the National Autism Transition Research Network Advisory Panel, the Arizona Community Foundation Board of Directors, the Arizona Advisory Board of BBVA Compass, you served as a federally appointed member of the Interagency Autism Coordinating Committee of the National Institute of Health. What else? Why don’t you do something with yourself Denise? You know you’re sitting on your duff, you’re not doing anything, what’s wrong with you out in Arizona? What are you guys smoking out there? DR: Well thanks, Hackie. The good news is that not all of those are current but they all have represented enormous benefits to what we’re doing now and what I’ve learned and some of the remarkable people who served in those leadership positions in those organizations and realizing that we are more the same than we are different in what we want, and what we want is a good quality of life, good options, not just for today but an opportunity of where we go next. I mean who among us has lived in the same home that we live that we live today that you know that we started with. There are some but for most of us we’ve had options as our lives have changed as we’ve learned, as we become employed as we’ve had you know have been married and had a life. And so we want more options for people for where they go after they leave their family home and then to allow them to grow to set the bar much higher than it was set for me and for our family when we were told 24 years ago to plan to love, accept, and institutionalize our son because there’s no hope for people with autism. And I committed back then, and I remain committed now that that is not the option, the only option for people with autism there are so many more. And we’re trying to be an example. So that when a child is diagnosed today we can not only tell that family that they can have a job in a home and friends in a supportive community. we can actually show them and what a different lifestyle that represents for a family who’s just had a diagnosis of autism to set the bar much higher than it was set for us. And we all know the difference that hope can make in any of our lives to get out of bed in the morning or get out of the closet or wherever we might be hiding from, to recognize that it is another day, there’s more that we can do and that we can all have greater hope for a future. That’s what all of us deserve. HR: Well you’ve answered the last question I had which was what is the biggest piece of advice you would give to a parent with a child who just got diagnosed, and I think I just heard it. set that bar high follow your parenting instincts, don’t give up, have hope, be positive, and what would you add to that? DR: I would add community. Never underestimate the value of friends, family in your community and what they can do to support you and in turn how you will be supporting them. It’s a beautiful thing our kids, including our son, he brings out the best in his fellow employees, he brings out the best in our family. And we hear this consistently with our clients at SARRC and our client and our students at First Place that you know often times in the workplace are the first to arrive, the last leave, the hardest-working on the shift, and they bring out the best and their fellow employees. There’s so much we can all benefit from with our neurodiversity and our different brains and thank you for shining a bright light on that Hackie. DR: LNCS is a recognition that we as parents need stepping stones too. And our vision is about creating confidence in the future. LNCS is an acronym that stands for lifelong learning for communities of support, recognizing that it’s up to each of us to create a supportive community where we shop, where we get our hair cut, where our teeth are cleaned, our legal counsel, our bank. So recognizing that each of these places that we support, each of these places that serve our lives, are opportunities for us to spread the word to recognize what autism is what it isn’t, recognize some of the behaviors things that these places of business and our community recreation, health care, and on and on can be more accommodating for individuals with autism and other neurodiversities. We all need some neurological curve cuts too. And believe that we can create safety and security in our community by creating more eyes and ears and people who care and that’s incumbent on all of us. HR: Very well said. Can you tell us about the checklist that you offer? DR: So LNCS has also been staffed by volunteer parents and we created a peace of mind portfolio because at the end of the day as moms and dads and caring family members we want peace of mind too and in order to do that we need to spend a little time on all those stacks of materials that we’ve been gathering for years about all the things we need to and should be doing and so this is a coaching group to help families through that process there are four quadrants in that piece of mind portfolio. There’s one that focuses on our financial planning. Another that focuses on legal, a third involves health care and medical and recognizing that somebody needs to know their story when we’re not there them, and the fourth is building a supportive community. So what we did is to create a checklist to make sure that families in their own minds would be ready for such a portfolio and they can find that online at www.firstplaceaz.org to learn more about links and the readiness questionnaire that will help you appreciate whether you’re ready for your peace of mind portfolio or whether you have more work to do. We are hosting monthly meetings locally here in Phoenix but also via webinar and people can also check out on our website to learn about the schedule for those meetings and the content that will be taking place. In October, the content will be focused on financial planning and in November it’ll be on legal concerns and then January focused on health and wellness. HR: Well we certainly want to get the word out to our whole Different Brains community, so they can check out those webinars. Are those webinars open to all? HR: And they’re free of charge? DR: And they’re free of charge. HR: Different Brains likes that. We want to get the word out. You touched on something that I think is the most underrated thing for all of us in society that affects the biggest single factor affecting our longevity, health, happiness, productivity, anything you want to measure whether it’s in the brain, whether it’s in your whole body. Socialization, and positive relationships, that what you’re doing constantly, Denise Resnik out in Arizona and beyond, is creating community, it’s creating support networks, creating relationships, creating a positive atmosphere for everybody to thrive to everyone’s benefit. DR: Our hope is that that we can demonstrate living in a community integrated into a community and demonstrate the positive outcome so we can have more places and spaces for all people — and that is our big vision. Our big vision for First Place is to ensure that Housing and Community options are as bountiful for people with autism and other neurodiversities as they are for everyone else. And that speaks to exactly where we started of looking up at the greater community and greater marketplace and recognizing that we aren’t so different. HR: Well Denis Resnik, it’s been a pleasure to speak with you today. Always a pleasure and we look forward to having you back here at Different Brains. DR: I look forward to coming back Hackie. Thank you so much for this chance to share and share our story and spread the word and again thank you and the team for what you do every day to keep us all connected. In this episode, Harold Reitman, M.D. speaks with Australian psychologist and award-winning author Tania Marshall.